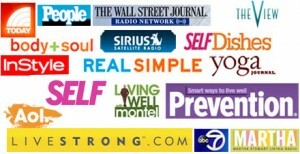 Through my posts, podcasts and videos on SkinnyChef.com, AOL Food, Prevention, Better TV and other outlets shown on the right, I provide a continuous stream of new and interesting ideas, recipes and materials. To make it easy to stay in the loop, many people have discovered the convenience of receiving the posts as a single weekly email. Try it, it’s 100% absolutely free! How Do I Get Your Email Updates? 1. Enter your email address in the form below. 2. Then click the “Join Now” button. To help ensure that you receive all email messages with images correctly displayed, please add to your address book or contact list.